Two years ago, when the Yankees sold at the deadline, they made several moves that helped shape the team that takes the field today. The lowest profile of those trades was the Ivan Nova trade, which netted the Yankees two players to be named later. Nova was an impending free agent with a 4.99 ERA (4.99 FIP) in 191.1 innings back from Tommy John surgery. He didn’t have much trade value. A few too many walks, but that 70.0% ground ball rate is the highest among the 1,004 pitchers with at least 60 innings pitched in the minors this season. By 2.4 percentage points too. Tarpley is way ahead of the pack. Not surprisingly, Tarpley generates those ground balls with a sinker. He’d always thrown a two-seam fastball, but he morphed it into a true sinker last year. Tarpley’s ground ball rate has spiked since he added the sinker. His role has changed as well. The Yankees moved the southpaw into the bullpen full-time last year. He’d been a starter his entire career prior to 2017. “It was like, ‘We’re going to move you to the bullpen, try to give you some innings,’ I was a starter at the time, and there weren’t many spots available. And I was like, as long as I get to play I’ll be fine,” he explained to Mark Sanchez recently. Tarpley was passed over in the Rule 5 Draft last winter — that’s not surprising given his injury and lost velocity, there were plenty of lefty relievers ahead of him in the pecking order — but chances are that won’t happen again this winter. His velocity returned, he’s getting a ton of ground balls and plenty of strikeouts, he’s left-handed, and he’s having success in Triple-A. The 2018 version of Tarpley is prime Rule 5 Draft fodder. Because of that, I think it is all but certain the Yankees will add Tarpley to the 40-man roster over the winter. And if that is indeed the plan, adding him to the roster early and giving him a look as a September call-up makes sense, and I expect it to happen. In fact, during a radio interview last week, Brian Cashman mentioned Tarpley by name when discussing Triple-A call-up candidates. Thanks to their trade deadline roster cleanup, creating 40-man roster space won’t be much of a problem in September. The Yankees have an open 40-man spot right now after designating George Kontos for assignment last week. Ryan Bollinger is still on the 40-man after his most recent big leaguer for a day stint, so he could be removed easily. Clint Frazier might be a 60-day DL candidate at this point as well. Point is, there is 40-man space available. A year ago at this time Tarpley was mostly an afterthought. The fact he went unpicked in the Rule 5 Draft tells us that. The shoulder injury took away the luster of his new sinker and the new bullpen role. This year though, Tarpley’s velocity has returned and his performance has been great. He’s already 25 and maybe he’s nothing more than an up-and-down guy, but age is kinda irrelevant. If you can get outs, you can get outs. 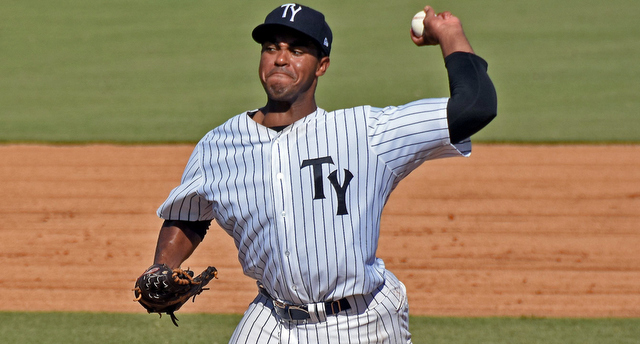 I suspect the Yankees will start to find out whether Tarpley can get outs at the big league level in September.